I’ve been awfully critical of the last few issues of Superior Spider-Man Team-Up, as I’ve found the series has had its struggles finding its voice within the larger Spider-verse of titles. Is it meant to be an addendum to Dan Slott’s larger Superior Spider-Man story, or its own unique title that works independently of the “main” series? My biggest complaint is that I’ve found Superior Team-Up to be straddling the fence between these two ideas, which ultimately muddies whatever it is writer Chris Yost is trying to say about the Spider Ock character. Superior Team-Up #7 goes a long way in finally being focused and clear about the title’s intentions, and as a result, it’s probably my favorite issue in the series’ short history thus far. 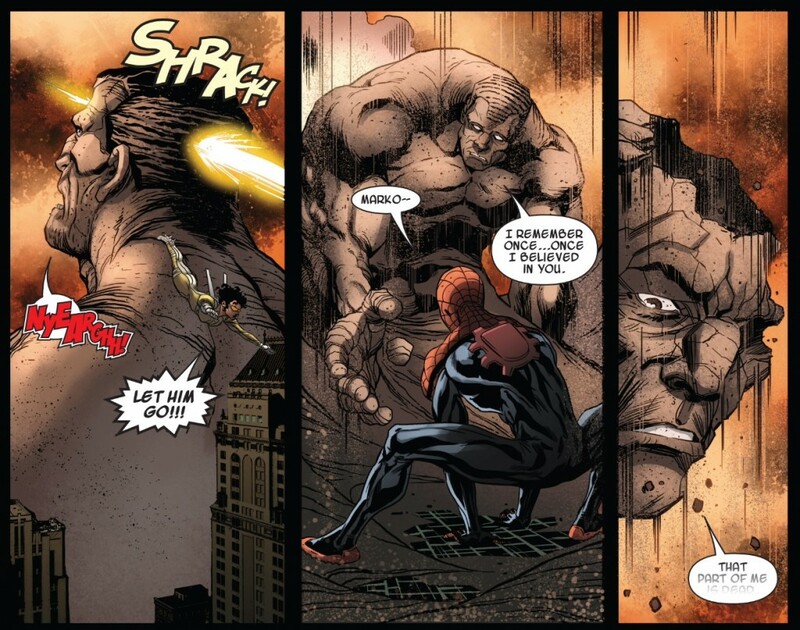 Yost’s resolution of the Spider Ock vs. “Superior Six” storyline doesn’t make me backtrack from my criticisms of Superior Team-Up #6 a few weeks ago – that issue still felt like a totally superfluous part of the story and I would have been infinitely more satisfied if Yost had just eliminated the middle part of his arc altogether and accelerated right to the conflict featured in Superior Team-Up #7. But I definitely found myself enjoying the payoff to this storyline that Yost has been slowly building ever since he jumped on as the writer of Avenging Spider-Man in January, even if the roadmap to this issue inadvertently sent me into the drink a few times. 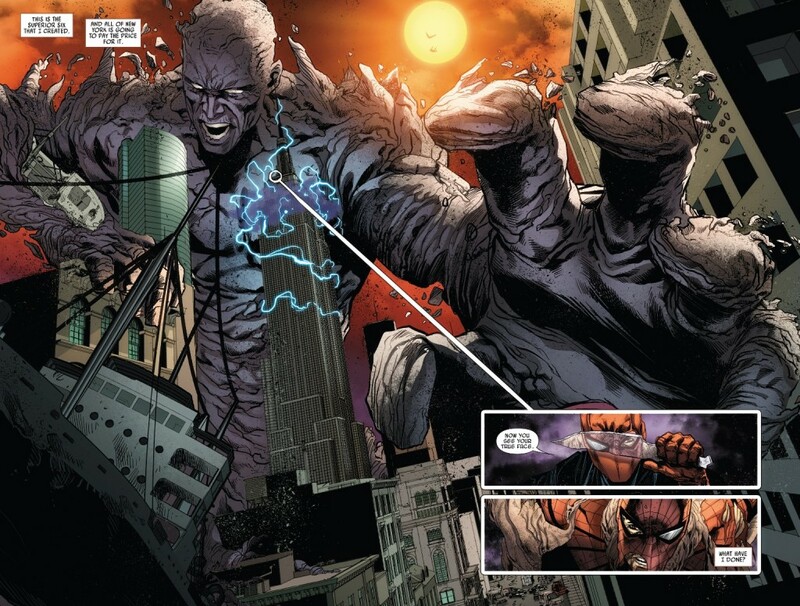 As has been the case during his tenure on Scarlet Spider, Yost has demonstrated the ability to get very raw and personal with his characters, leading to some well-written moments of soul-bearing honesty and introspection. Yost’s more cerebral take on characterization was part of what made me sincerely enjoy some of his earliest issues of Avenging Spider-Man as he took the tried and true team-up trope and mixed in moments of Spider Ock observing “true” heroes like Thor and studying what makes these icons trudge on so selflessly. 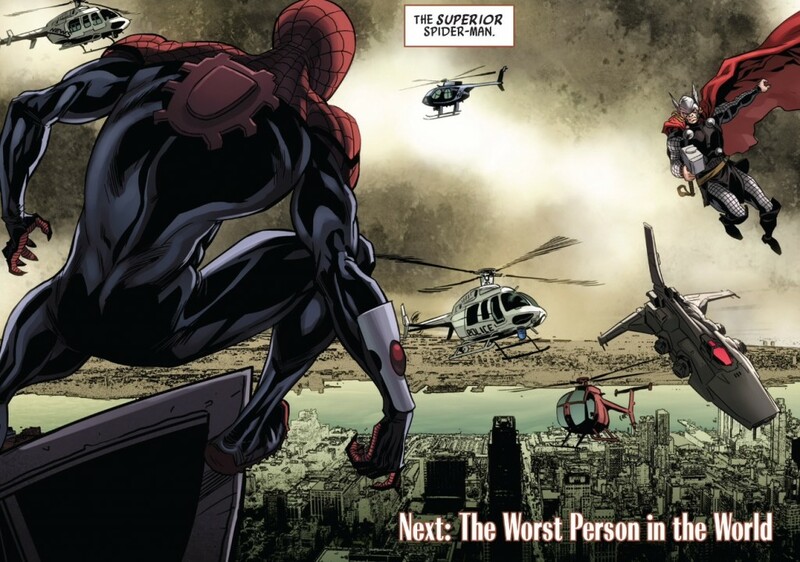 In many ways, I thought Yost was doing most of the heavy lifting in the character development department when it came to the Superior Spider-Man, despite the fact that the whole concept was conceived by Dan Slott. Some kind of switch seemed to flip when the Superior Spider-Man had his “Parker-ectomy” and his first appearance involved a laborious S.H.I.E.L.D. mission aboard a Helicarrier. All introspection and nuance had been displaced by an overbearing arrogance, and Spider Ock’s obnoxious behavior continued full speed ahead in Superior Team-Up, even as Slott was backing off the gas a bit in the main Superior title (this most recent issue notwithstanding). 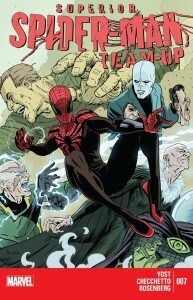 Superior Team-Up #7 seems to mark the moment where both main Spider-Man titles have synchronized, as Yost’s unrecognizable characterization of Spider Ock in recent months has started to resemble something I actually find myself want to read about every month (though recently the series has been pumped out every two weeks over). Spider Ock is still as arrogant as ever, but his failure to forcibly convert the Sinister Six into a do-gooding superteam has now led the character to a place of unprecedented self-loathing and disgust. 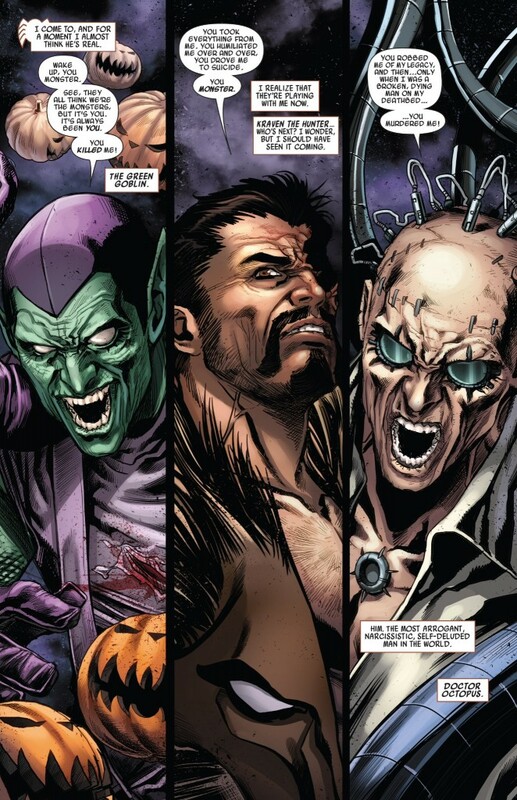 The comic’s opening page (expertly illustrated by Marco Checchetto, who has been a true revelation on this title and warrants consideration for the Superior Spider-Man artist rotation) of the Chameleon pretending to be Green Goblin, Kraven and Doc Ock, taunting “Spider-Man” for leading these characters down a path of madness and (temporary) death is a delightfully surreal way to kick off this despairing story. The irony of this scene is just off the charts – Otto being forced to confront the sins “committed” by his predecessor Peter Parker is the kind of warped storytelling I wanted to see out of the “Superior” status quo from the get-go. What good is it to have Doctor Octopus masquerading around as Spider-Man if he is never going to be confronted about his predecessor’s actions and choices – especially as they are seen through the lens through someone as twisted as the Chameleon. And given the nuanced and complex way Sandman has been written over the years, Yost delivers a nice little nod to the character’s biography by having good ol’ Flint Marko cut Spider Ock deep when he tells him that he “used to believe” in him. Unlike his other Sinister Six teammates, Sandman has always tapdanced on the line of good and evil – even serving as a member of Silver Sable’s Wildpack and also being the first to turn on Doc Ock during the David Michelinie/Erik Larsen “Return of the Sinister Six” storyline in the 1990s. 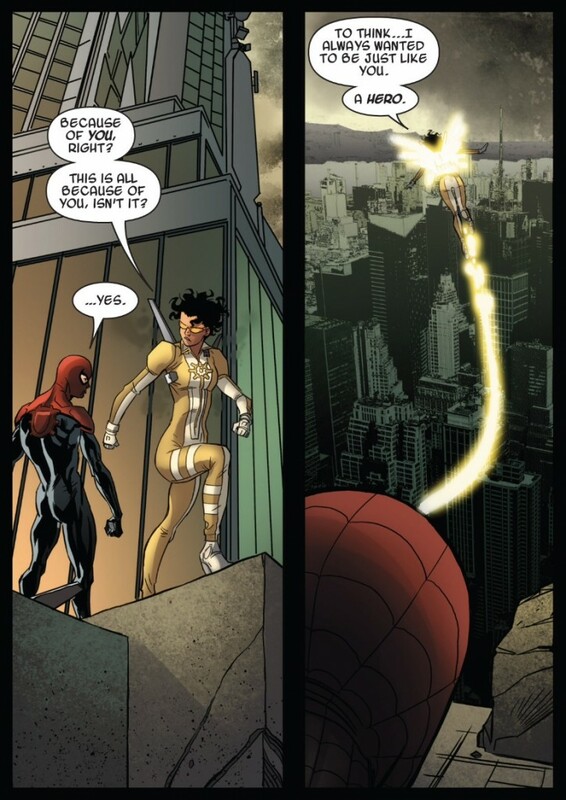 I imagine Sun Girl’s dismissive tone with Spider Ock after she manages to save New York City from Otto’s megalomania at the end of this story is designed to serve as the “final insult” of sorts, but I still can’t say with any certainty if Yost did a good enough job developing Sun Girl as someone I should care about in order for the emotional weight of the moment to make an impact. As such, I saw the twist ending with Sun Girl serving as more of an insult to Spider Ock’s already bruised ego – how can a “D” list character like this succeed in a way where he failed – rather than some kind of great revelatory “Uncle Ben” moment. Still, Yost ends the story as powerfully as he starts it – with a line by line callback to Amazing Spider-Man #700 where Otto remembers telling Peter that he would carry on as Spider-Man in the name of heroism, not villainy. The final image of Spider Ock looking up at the New York City skyline as Thor (and I’m assuming other Avengers) along with some helicopters (guessing it’s either police or S.H.I.E.L.D.) approach him is an extraordinary gut punch from Yost and Checchetto and one with a sense of finality to it. I almost expect the screen to fade to back and the credits to roll, but we know that’s not the case as the next issue almost certainly will serve as some form of epilogue, and then, of course, the Superior story continues into the “Goblin Nation” arc in February. Despite some of the warm and fuzzy feelings I’ve expressed in this post, I’m still not ready to declare that my “faith is restored” in the Superior Team-Up concept, but Yost has at least demonstrated that after a good six months of meandering, the title is capable of delivering stories that both work in concert with Slott’s larger status quo, while also making interesting statements of its own. The series is still lacking the goofy fun element that its Bronze Age predecessor Marvel Team-Up had in its heyday (or even what Avenging Spider-Man gave readers during its initial run with Zeb Wells manning scripting duties) but … baby steps. The series is lacking the “goofy fun element”? This version of Spidey is lacking any sense of humor, so how can we expect a goofy fun anything? Entertaining, yes. Funny and uplifting, no. I think it’s fair to say that Slott as a writer takes things a little less seriously than Yost does. For the most part, Slott writes Otto as a tool who’s gotten lucky which makes his stories a little goofier. Yost writes Otto more diabolically. Plus I was also cementing on the fact that the Spidey team-up books have long been a home for quirkier, irreverent stories, regardless of what’s going on in the main book.